The High is proud to present the most significant North American exhibition in 20 years of work by Yayoi Kusama (Japanese, born 1929), one of the 20th century’s most influential artists. Organized by the Hirshhorn Museum and Sculpture Garden, this exhibition will take visitors on a once-in-a-lifetime journey through more than 60 years of Kusama’s creative output and will explore the evolution of the artist’s Infinity Mirror Rooms, her iconic kaleidoscopic environments. The exhibition will present six of these rooms, along with other large-scale installations, sculptures, paintings, works on paper, and archival photographs and films from the early 1950s through the present. 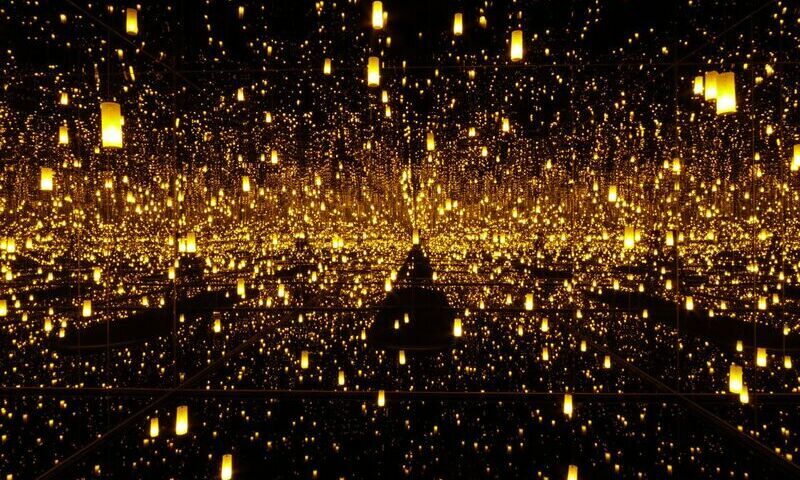 Also on view will be numerous new works by the 87-year-old artist, who is still very active in her Tokyo studio, including her recently completed Infinity Mirror Room—All the Eternal Love I Have for the Pumpkins (2016), featuring dozens of Kusama’s signature dotted, bright-yellow pumpkin sculptures. Other major works will include the artist’s original landmark installation, Infinity Mirror Room—Phalli’s Field (1965/2016), featuring a vast expanse of red-spotted white tubers in a room lined with mirrors, and Dots Obsession—Love Transformed into Dots (2007), a mirrored room filled with inflatables suspended from the ceiling.